Kataru's love and pursuit of Farming: Transpiration: How do plants release water into the air? Transpiration: How do plants release water into the air? When sunlight falls on a leaf, its radiant energy excites the water molecules in the leaf. The H2O molecules heat up, and they start bouncing around and eventually come up to the surface of the leaf. When they absorb even more energy, bonds between adjacent H2O molecules break, turn into water vapor and evaporate into the atmosphere. 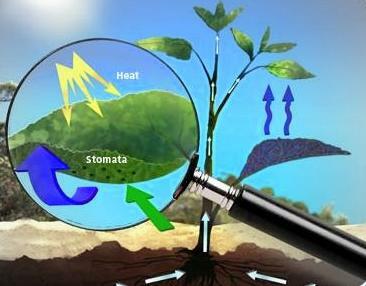 Transpiration also cools plants, enables flow of nutrients and water from roots to shoots. The more water transpires from leaves, the more water is sucked in from the ground via roots by capillary action.